The YotaPhone 2 comes with a surprisingly good 8MP auto-focus camera. It takes images in a maximum resolution of 3264x2448 pixels. It has a built-in HDR mode, which can even be set to activate automatically in certain shooting conditions. The camera UI is intuitive and requires practically no time to get used to. The image capture button is on the right side. Timer, flash settings, grid view, and the ability to switch to the front-facing camera are available via a menu in the top right corner. The shooting options are located on the left side. They include regular shots, Panorama, Lens Blur, Photo Sphere, and Video. HDR+ requires manual activation. We wish that there was an auto option available, though its lack is hardly a deal breaker. The camera locks up focus rapidly. You can change the focus point via a tap on the screen. Users can opt to set their image exposure manually via a toggle in the settings menu. Resolution of the photos, as well as the quality of the panoramas can also be tweaked. YotaPhone 2 snaps amazingly good 8MP shots - if our test charts and posters are to be believed, it's even better than the 8MP camera on iPhone 6. The shots have plenty of resolved detail, impressively contained noise without any obvious noise reduction smears, and no oversharpening. Best of all, the processing itself is so mature that when pixel-peeping, it's hard to tell the photos come from a cameraphone and not a dedicated digicam. Turning on HDR does a good job of extending the dynamic range. It resolves more detail in the shadows, but it leads to somewhat unnatural looking highlights. YotaPhone 2 supports shooting 180-degree panoramic pictures. You can choose between three settings for the output resolution - low (high-speed), medium (normal speed), and high (slow). The high resolution option shoots at about 15000 x 2800 px. The resolved detail and contrast in those pano images is quite poor and the focus seems inaccurate on all shots we've taken. You can use the rear camera for a selfies by switching the live camera feed to the rear display with the Yota Mirror. This way you will have the viewfinder facing you. The YotaPhone 2 enters our Photo quality comparison tool to face off against other 8MP shooters and you can see it even outdoes the iPhone 6 in all three test charts. The camcorder UI shares the same viewfinder with the still camera. The YotaPhone 2 records 1080p videos at 30fps. The bitrate averages about 20Mbps, which explains the good amount of resolved detail. Audio is recorded at 96 Kbps in stereo mode with a sampling rate of 48 kHz. 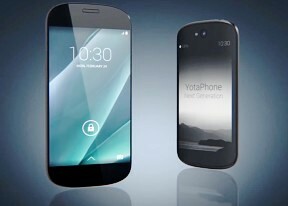 Videos by the YotaPhone 2 are not on the level of the still images. Indeed, there is is enough detail, the colors are good, and the framerate is smooth. However there is a certain softness to them and they are nowhere as good as the ones shot by the iPhone 6. This is a short video sample, which we've uploaded on YouTube. And this is an untouched 1080p video sample taken straight from the YotaPhone 2. The YotaPhone 2 enters our video quality comparison tool to be pitted against other 1080p camcorders. You can choose the devices you compare it against from within the tools' page. You can see the that unlike the still images, the YotaPHone 2 fares worse than the iPhone 6 when it comes to video recording.